Though I was disappointed to see Forest miss out on promotion back to the Premier League this season, I am happy about the outcome for at least one reason. Since I’m not supposed to want wear kits of my beloved Spurs’ (current) rivals, Nottingham Forrest spending another season in the Championship means that it’s a least slightly more kosher for me to rock this latest effort from the vaunted “Tailored by Umbro” line from Nike’s soon-to-be-hawked brand. 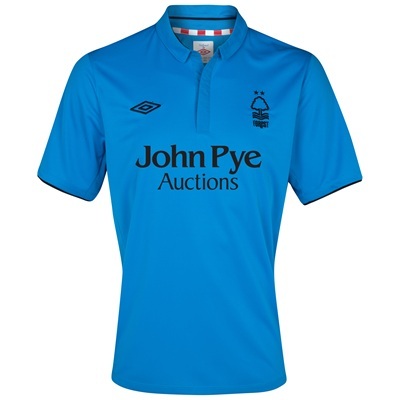 My desire to nab Nottingham Forrest FC’s 2012-2013 away kit — similar to Sunderland’s away shirt from last season — is mostly just a sign of my weakness for the bright blue / teal hue Umbro chose for it. The perfect summer color if you ask me. 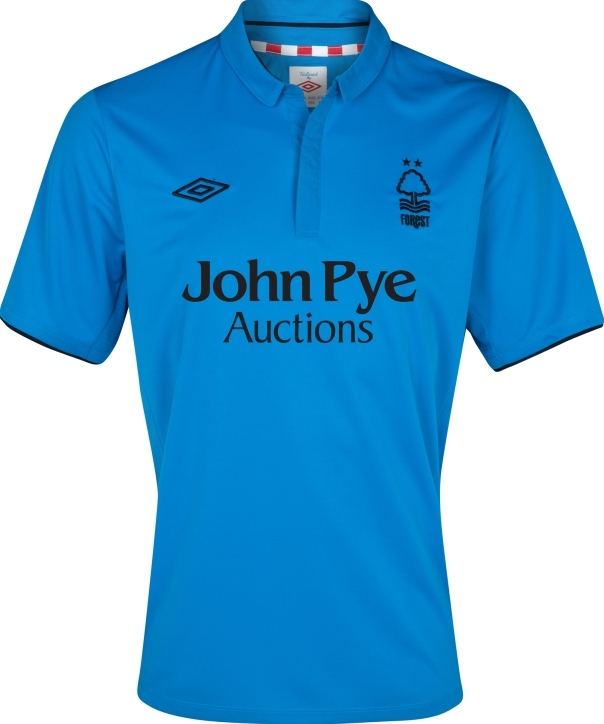 But I’m also a huge fan of the shirt’s simple two-tone design, with only the black of the sponsor, club crest, Umbro logo and thin piping on the sleeve breaking up the blue. And as always, the discrete, detailed inclusions, such as the club’s traditional colors in red and white piping on the inside of the collar, help to give the shirt the extra character. I even dig the little, micro-collar. And the matching socks are… well, they’re eye-catching if nothing else.